Large 11" Architectural Letters - - large decorative individual letters. Custom made monogram style letters in the font and color you select. Made in the USA. Each 11" initial is ready to hang on any wall indoors or out and comes with mounting holes and stainless screws (number varies depending on piece). Please order the letters you want one at a time. Accent your home or business with your initials. Add a monogram to a front door, garage door, or bedroom door. Hang one, two, or three initials in any entryway. Identify a commercial building by spelling out its name. Decorate the side of a barn or chimney. Made from 1/8" thick acrylic. Dimensions: approximately 11.5" x 11.5" x 1/8". Colors: black, burgundy, ivory, white, grey, charcoal, red, yellow, green, blue, and brown. Four distinctive fonts: signet, artisan, storybook, and elegance. 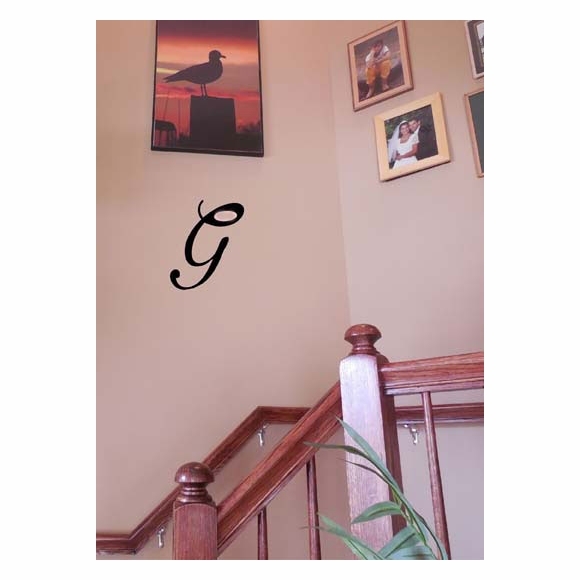 Large 11" decorative initials make impressive wall art. Made in the USA.